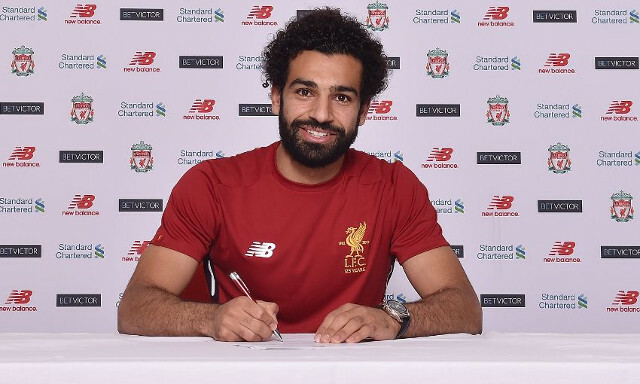 After weeks of lengthy negotiations, Liverpool have finally completed a deal that will see Mohamed Salah join the club from Roma on a five-year deal. The Egyptian winger has joined for a fee of £36.9million, which could potentially rise to £44million, thereby making him the club’s most expensive player of all time. News of Salah’s arrival came late on Thursday after the former Chelsea man had spent the day in Liverpool undergoing his medical before travelling to Melwood later in the afternoon to finalise his move. The club made the official announcement on Twitter after images of Salah in the Liverpool kit had already emerged minutes earlier. Salah will wear the No.11 shirt previously worn by Roberto Firmino, who will now become Liverpool’s new No.9. The 25-year-0ld is expected to earn £90,000-a-week and will be eyeing up an emphatic return to the Premier League after enduring a tough spell at Chelsea back in 2014. An agreement was eventually reached on a price-tag after Liverpool had seen their initial £28million bid rebuffed by Roma earlier in the month. His hefty price-tag could well be worth it though with Salah having scored 15 goals and registered 13 assists in Italy’s top flight last season. Salah arrives with the explosive pace and directness designed to make him a perfect fit to Jurgen Klopp’s attacking setup and capable of having an emphatic impact similar to that of Sadio Mane’s in his first campaign at the club.